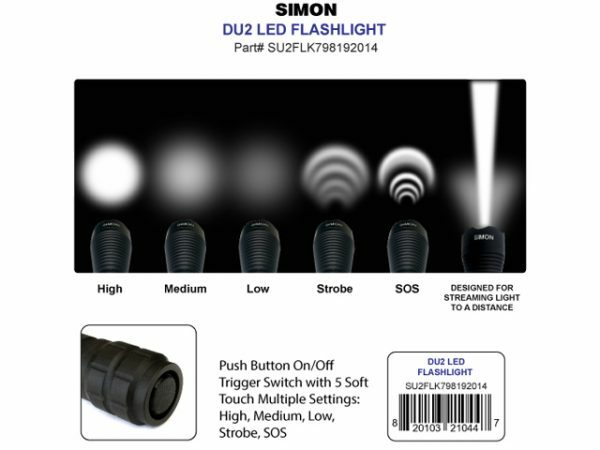 Looking for one of the brightest flashlights for less than fifty bucks? Well you found it. 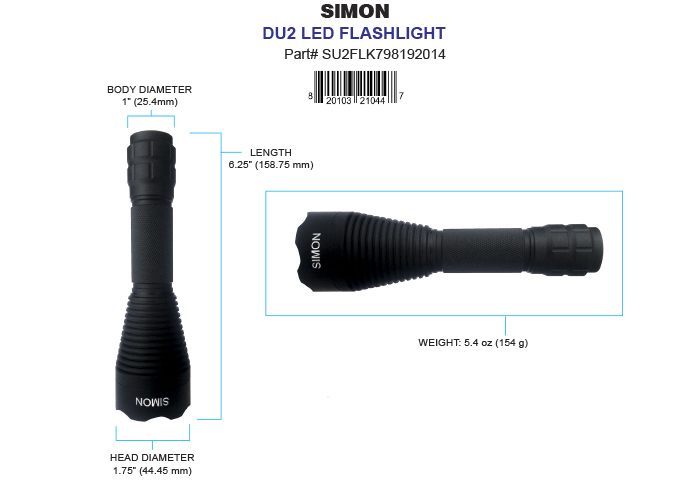 The Simon Cree Led Flashlight DU2 Pro is a small powerful tactical flashlight and is rated among law enforcement agencies as one of the top flashlights to have in its arsenal. 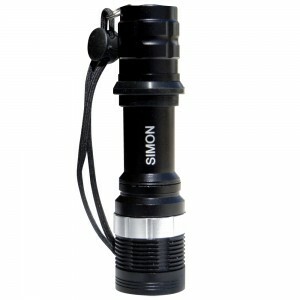 It boast the Cree XML chipset with the U2 diode that puts out a max of 700 lumens and is cradled in a custom aluminum shaped chrome reflector to help stream lite to a far distance. It dry weighs in at 5.4 ounce or 154 grams and stands on end to a whopping 6.25 inches or 158.75 mm with a central body girth oh 1” or 25.4 mm with the head unit coming in at 1.75 “ or 44.45mm. The stealth flat mat black anodized finish helps avoid detection from reflecting light and mounts on most standard Weaver or Picatinny rifle and shotgun mounts. 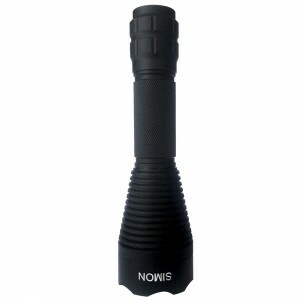 This tactical led flashlight also comes with a jagged edge head ring to break glass windows or to use in self-defense hand held man to man combat tactics. 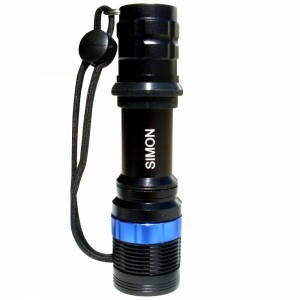 It is machined from 6061 grade of aircraft aluminum for light weight and durability. Simon recommends ONLY you power up the DU2 tactical LED flashlight with a 3.7 volt Simon Panasonic 18650 lithium ion cell battery with a Protected Integrated Circuits (PIC) with the minimum of 3400 mAh. (Battery NOT Included) Note: There are many fraudulent suppliers online for this specific lithium ion cell battery so be careful when you purchase it online. 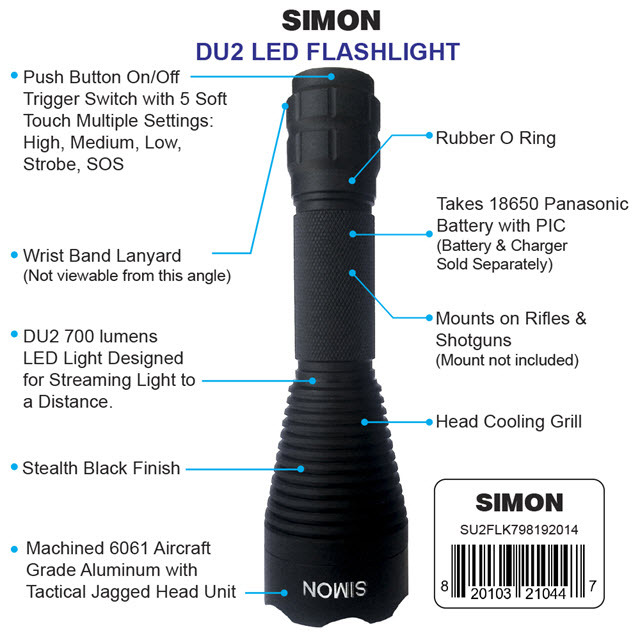 The DU2 tactical flashlight powers up on high every time you turn it on with the rear soft trigger switch ON/OFF button. 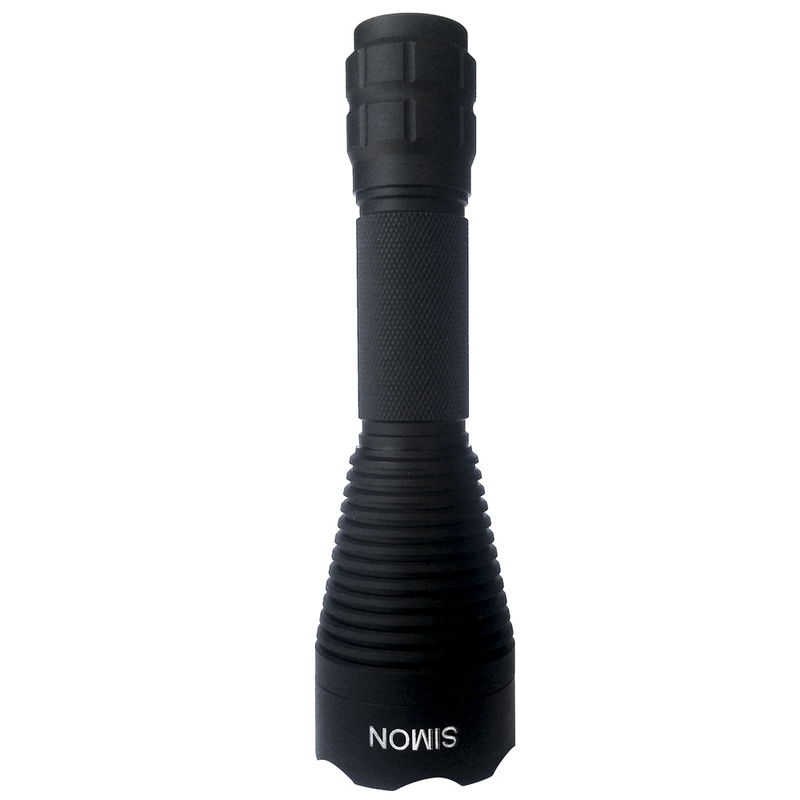 Soft touching the rear trigger switch enables you to utilize the five full modes: High, Medium, Low, Strobe and SOS for emergency situations when needed. Just Click on the BIG ORANGE Button Above and Buy Yours Now!